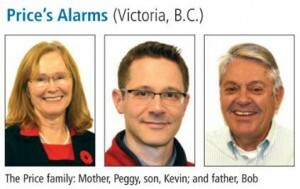 Bob and Peggy Price of Victoria, B.C.-based Price’s Alarms never assumed their son Kevin would go into security. At university, he studied art and then went to work in film and animation. After about four years, however, he came back to the business and was given a comprehensive training course. Bob Says they wanted to instill in Kevin an understanding that he has to be prepared to do everything he asks the employees to do. “You should lead by example. You shouldn’t be afraid to do any of the mundane jobs that have to be done,” he says. Peggy, vice-president of administration, says it was also important for their some to learn that the responsibility for decisions will always come back to him. Instead of saying, ‘he told me to do it,’ Kevin has to ask questions, collect information ,reason out the answer and be willing to stand by that answer. The buck stops with him,’ she says Kevin’s earliest work experience included flipping burgers and handing pamphlets to tourists. But, as soon as he turned 18, he got his security licence and worked a few years as a technician and in service dispatch. Returning to the business Kevin, vice-president of operations and the fourth generation in the family business, started at ground level. “I was packing boxes and pulling jobs for the techs and worked my way from inventory and purchasing into sales and service,” he says. Kevin says his father taught him always to be on the lookout for ways to increase quality and efficiency.